when you are planning for big achivements you should care aboute your time.you remember ever One day you will execute your plan it will be must perfact in action. i did many experiments and this all wasteg of my time. as name of vleseva it made for rural entrepreneurs to help them and providing information and services as per requirements of rural development.Full meaning of VLE is Village Level Entropreure and the full concept of VLESEVA is Providing Opportunities and services to all small entrepreneurs.we know that in the rural areas all peoples are depending on agreeculture systems.so that we can say that the main purpose of vleseva is helping parnter for village level entrepreneurs. Concept of VLEसेवा Rural Empowring - basicalay vleseva is made for village level enterpraour to providing services , information , support and opportunieties to village level enterpranours. development time line intial time 5 month i spended for vleseva planning and development. Source of Revenues of VLESEVA VLESEVA Walet , Adsense , E-comerce , Third party Sale. Services Social Networking ,Online Exam Preparation , Artciles Writing , Current Affaires , Messaging , Like | Dislikes | Share | Comments on each events. Partners No Partner in Company . This is One Man Company . Used Technology MVC5, Asp.net,HTML5,CSS3,Angularjs, Media Queires,Java Script etc. Source of Revenue Sponsorship , Exam subscription, Advertisement , Exam API, Online campaign etc. Is this pay or Free All Services of WHYBAY are FREE! for Our User and it will be ever FREE! . Actually i want to make An Answer site for Multiple Question . so that I started works with this concept . A presentation of data in a particular format, triggered by a controller's decision to present the data. They are script based templating systems like JSP, ASP, PHP and very easy to integrate with AJAX technology. 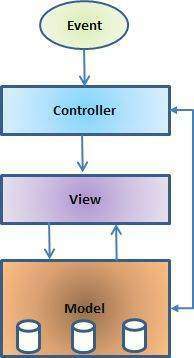 The controller is responsible for responding to user input and perform interactions on the data model objects. The controller receives the input, it validates the input and then performs the business operation that modifies the state of the data model.